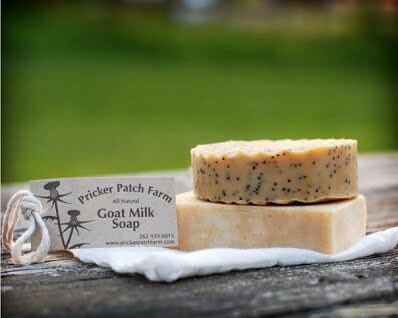 Pricker Patch Farm goat milk soap is handmade with only pure and natural ingredients. With the maximum possible percentage of pure goat milk, it is one of the most moisturizing bars available, leaving you skin feeling soft and silky smooth. Goat milk soap has a PH level similar to our own which helps protect the sensitive outer layer of skin from harmful bacteria and everyday chemicals. It is extremely beneficial to people with sensitive skin, and those prone to acne or eczema. Because it doesn’t contain additives like those found in commercial soaps, the risk of skin irritation and allergic reactions is greatly reduced. The alpha-hydroxy acids found in milk naturally slough off dead skin cells, leaving skin soft and smooth, while the natural nutrients in goat milk moisturize skin and reduce rough patches and itchiness. The proteins in milk even kill acne-causing bacteria! We hand craft our soap in small, controlled batches, never adding harsh chemicals or preservatives that could irritate the skin. Our ingredients are all natural and of the highest quality, ensuring consistently excellent products. Bars of soap are 4 ounces when cut, but lose a little weight while drying. They are $5.00 each, or five for $20.00. In addition to natural unscented soap, we offer the following blends, scented exclusively with pure essential oils. Please call for availability, or to request custom scents or blends. ﻿﻿Milk and Honey ﻿﻿- honey is added as a natural humectant, and adds antibacterial properties to this soap. Gardner’s Friend (lemongrass poppy seed) - the name says it all. This soap is a favorite with everyone! Tea Tree (antibacterial, antifungal and antiviral!) - excellent for those with skin problems such as acne, eczema, dermatitis, and psoriasis. Tea tree is anti fungal and anti bacterial, making this a great “deodorant” soap, as well. Oatmeal, Milk and Honey - has the added benefit of soothing oatmeal, with ground oatmeal for gentle exfoliation. Lavender Sleep Soap - a great, calming, bed-time bar! Honey Almond - almost good enough to eat! Cinnamon Spice - clove and cinnamon give this soap a warm, spicy scent. Coffee Scrub - with its odor removing qualities and scrubby grounds, this soap is great for the kitchen! Scent Free – nothing is added. This is our pure and natural, completely scent free soap for the youngest and most sensitive family members. Lemon Eucalyptus – essential oils of lemon and eucalyptus make this a great, fresh soap. Lemon peel is added for exfoliation. Summer Bloom – essential oil is added to make this soap flowery, soft and feminine. Cedarwood Sage – fresh and earthy, this soap smells like an autumn wood. Rosemary Mint – The peppermint in this soap makes it extremely energizing, and leave you feeling fresh and clean all day long! Clean Shave – clay has been added to this unscented soap to make it more ‘slippery’ for shaving. Bars of soap are also available through our ETSY store and at various local farmer's markets during the summer and fall.